Banbridge Town boss Ryan Watson was frustrated by the end of another Cup run as his side were knocked out of the Irish Cup on Saturday. In truth, the real knock-out blow came when the draw was made. Pitted against an Ards side battling to make it back into the Premiership, Town only ever really stood an outside chance of making it through to the fifth round. Saturday’s 4-1 defeat then, whilst perhaps not all that much of a surprise, was still disappointing for a Banbridge side wishing for a lasting distraction from the Championship Two slog. 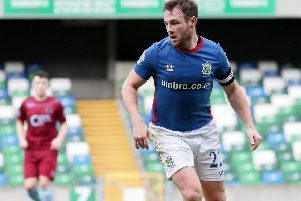 Ards were only relegated from the top division on the final day of last season and, sitting third in Championship One, are determined to make an immediate return. Nonetheless, for a brief period after half-time at least, Town at least caused them some concern. “It was a very tough game, as we always knew it would be,” Watson said. “They were a step above us. We didn’t really give it a go at all in the first half. “They started well and dominated. We couldn’t really find our feet. It was wave after wave of attack. “We got in 2-0 down at half-time and we were probably lucky to get away with that. “In the second half then, we came out and gave it a go. We got a goal back and that gave us a good lift. “We had another chance when Mattie McCartan broke through. He hit a good effort but it was well saved by the Ards keeper. If that had gone in, it might have given them something to think about but they pushed on and got a third and that was really game over for us. “We hoped they might have been tired after their game against Cliftonville but they were very professional and took their goals well with some good finishes.